If the liner notes to The Exotic Moods of Les Baxter are to be believed, Baxter himself considered his film scores as a way to pay the bills--I believe "lucre" was the term used--and Exotica as his art. I seem to recall him saying something to the opposite effect in the liner notes to a soundtrack CD - that he preferred film music because it enabled him to write in a more serious vein. Both sound right as Mr. Baxter was known to be something of a contradictory character often saying whatever worked best for himself at the moment. Exactly. 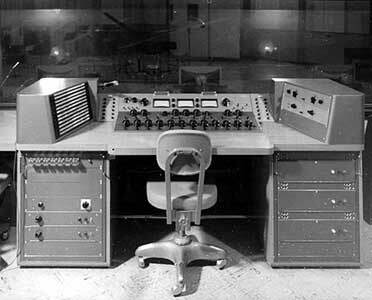 Capitol used an 8-channel mixer, with close miking, and mixed on-the-fly to mono, with effects such as reverb being added directly to the master. Total quality control - the great Roy DuNann, later of Contemporary, worked on many of these. For the stereo sessions, they simply strung up two mics over the ensemble and hoped for the best. Not exactly true. 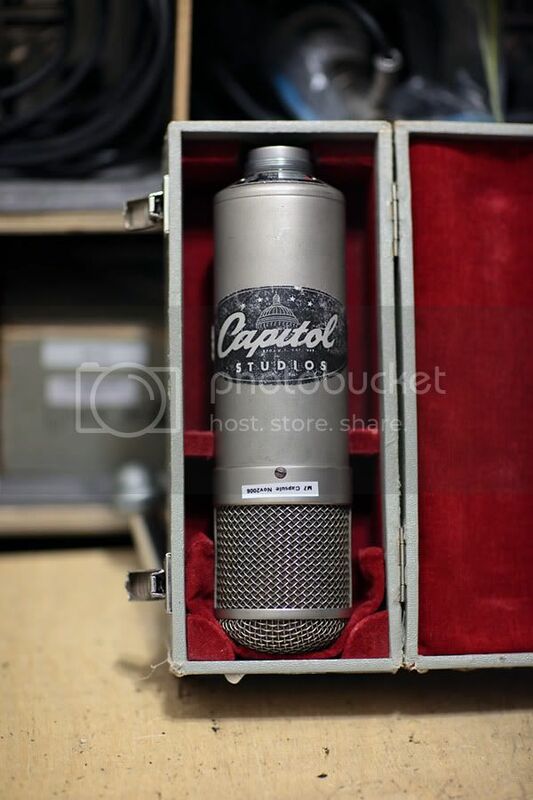 Capitol used multiple mics for their stereo sessions going back to when they were doing experimental stereo recordings at their original studio on Melrose Ave. I own a book that details just what was used on those sessions. They took great pride in their stereo work. The two finest engineers working at Capitol back in the 1950s were John Palladino and John Kraus. 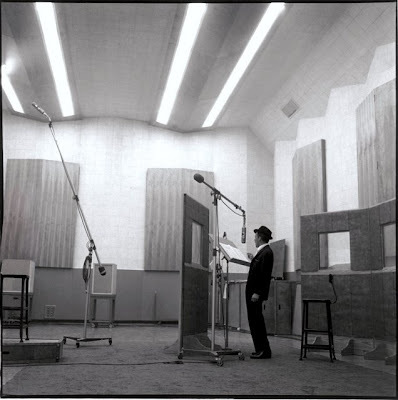 The best sounding Sinatra sessions were done in Studio A at Capitol-Melrose in what had been a large radio theater. The building had started out as a film lab, but after a fire it was later sold to NBC. They rebuilt it as their flagship radio studio in Los Angeles. When NBC built a huge complex on Sunset and Vine, the Melrose facility was taken over by KHJ radio. In the late forties, Capitol took it over and remained there until their facility on Vive was built. Then KHJ moved back into the structure. Sinatra would invite guests to hear his recording sessions. The theater atmosphere made it easy for them to be seated comfortably. Capitol set up the orchestra on the stage facing the audience. Capitol's reverb chambers were located up on the roof of the building. 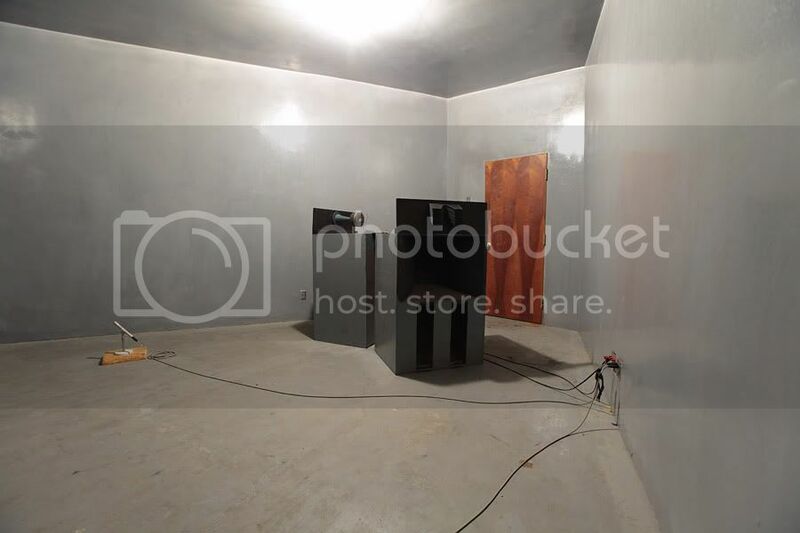 Capitol prided themselves in having the best 'live' chambers in the business. Later, once they relocated to their current facility, they placed the chambers deep under the parking lot. Once Capitol moved to Vine Street, they had a hell of a time getting the acoustic right in the new studios. At first they were awful. Besides the mic on Cole, there are four mics seen in the photo. Here's a rare photo showing Sinatra with Elmer Bernstein at Capitol-Melrose during a session for "The Man With the Golden Arm" in 1956. It seems lyrics were written which Sinatra sang at this session for a record release. The film's scoring sessions were done at Goldwyn. As you can see it has quite a few inputs. They ran the tape at 30 ips to get the best possible signal-to-noise ratio. And before the advent of the stereo LP, home audiophiles were enjoying 1/4" two-track prerecorded tapes. I still have several that were purchased in the mid-1950s. One was issued by Captitol as a sampler narrated by Art Gilmore. The sound on it is still amazing. 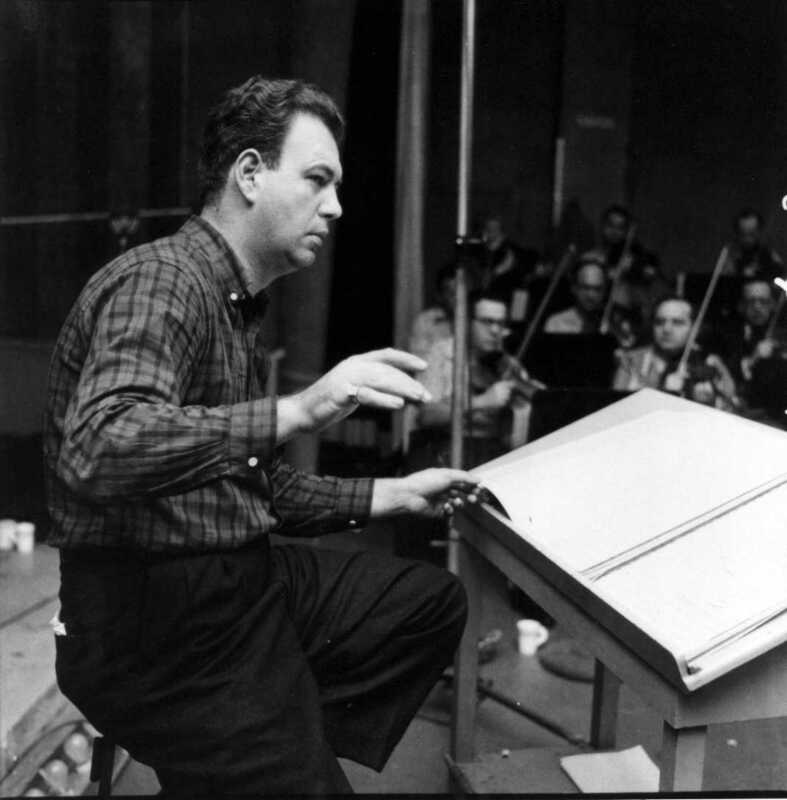 There's a recording of Nat King Cole that sounds like he and the orchestra are in the room. Those recordings used a 'tree' of three condenser mics placed above and to the front of the orchestra. In many ways they still sound better than anything recorded today. It's now common to use up to 96 channels along with adding tons of digital processing that just muck up the sound. I don't really care for Baxter's film music - too many harsh atonalities and melodramatic outbursts for my taste. However, I really like these exotica thingies. It's a relatively new discovery of mine (you can probably gather that I did NOT grow up with them), and it's something I would like to check out further. I'm not sure I would take the plunge for an entire box, but a representative "best of" compiltation thing would be nice. I totally agree. Baxter's talents were best demonstrated by his album work. Check out this website. 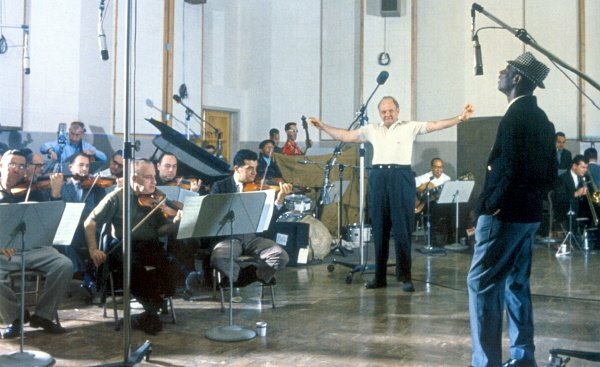 It has several out-takes from Sinatra recording made at Capitol from 1955 to 1960. Some are in stereo. The sound quality is excellent especially with "Nice 'N' Easy." While the sound quality may not be perfect on the unmentionables (they've also added stereo spread to the mono recordings! ), in most cases it is better than what's currently on the market. The newest Concepts box set sounds god-damn-awful: no-noised to death and stereo spread on the mono recordings. It hurts if you are listening to the few really good remasters (the 1990 3 CD "Capitol Years" set and the MFSL remaster of "Only The Lonely") and know how this recordings could sound. Unfortunately, the same can be said about many other Capitol artists. I think the lowpoint may very well be Nat King Cole: 90% of the Capitol CDs I've heard are junk. Peggy Lee isn't much better. I've downloaded "Quiet Village" from iTunes (from one of the few Capitol CDs issued at all -- naturally out of print by now!) and it has the same amateurish mastering. The closest think to a comprehensive LB exotica comp was the "Exotic Moods" 2-disc set from the 1990s. It is out of print but it's on iTunes, only 9.99 for like 40 tracks. It is marred by some sound issues - too much processing for my taste - but it's a lot of bang for the buck. If you want to spring for an individual album, "Tamboo" is probably overall the most representative of his exotica albums, and contains many of the stylistic approaches he would develop further in later albums. It is available as a legit CD (on the Collectibles label, paired with "Skins") and is available as a download for only $6.99. That was the first Baxter exotica I bought back in the 90s. I had been a long time fan of Martin Denny growing up with his music playing in our household when I was a boy. When I later learned that many of my favorite Denny tunes were his versions of Les Baxter's exotica music, I took the Baxter plunge. His was after all the original exotica and I wanted to sample his generally more orchestral approach as compared to Denny's small combo take. I became an instant Baxter fan on hearing these lush, impressionistic pieces mixed with a bit of jazz, ethnic rhythms and other diverse elements and started buying all of the available CD releases of his exotica albums. So for me the Exotic Moods set was the prefect introduction to his exotica music and is a good starting place for someone who is curious or thinks an overall compilation will meet their immediate needs. That was the first Baxter exotica I bought back in the 90s. I had been a long time fan of Martin Denny growing up with his music playing in our household when I was a boy. When I later learned that many of my favorite Denny tunes were his versions of Les Baxter's exotica music, I took the Baxter plunge. His was after all the original exotica and I wanted to sample his generally more orchestral approach as compared to Denny small combo take. I became an instant Baxter fan on hearing these lush, impressionistic pieces mixed with a bit of jazz and other elements and started buying all of the available CD releases of his exotica albums. So for me the Exotic Moods set was the prefect introduction to his exotica music and is a good starting place for someone who is curious or thinks an overall compilation will meet their immediate needs. Back in the 1960s I was lucky enough to catch Martin Denny live at Duke Kahanamoku's which was located in the International Marketplace in Waikiki. I'll never forget how great Denny and his group performed. The joint was packed. That summer I also watched a live performance of "Hawaii Calls" with Webley Edwards along with some great performers of Hawaiian music. They'd tape the shows performed on an outdoor stage at the Moana Hotel and then broadcast them all over the US and on FM in stereo. Just checking in to find out if any progress has been made on this box set. Since it was all hypothetical.......no. Capitol has just re-mastered all of the Les Baxter exotica albums and put them on iTunes. There are 8 albums available now, and supposedly 4 more will be added soon. Yes, I know it's not film music exactly; but it sure sounds like film music, and these albums were a huge influence on a generation of film composers. Plus, recent Les Baxter film score releases have sold out, so there is a demand. Assuming Capitol would grant the rights, it would be easy to do a box set of, say, 10 albums, with 2 albums on a disc, 5 discs total. They've just been remastered by Capitol, so no one would have to spend significant money on remastering. Most of the currently available CD versions of these albums are mastered from vinyl. Even on the compressed format, the iTunes remasters sound better than the vinyl transfers. I would buy this box set immediately. They are not bootlegs, they are absolutely legal in the countries where they are manufactured. Given that logic, you can't justify 95% of the specialty labels' releases. I sure can. Soundtracks have a strong but small niche market. I haven't noticed all that many labels doing the same with exotica at this point.